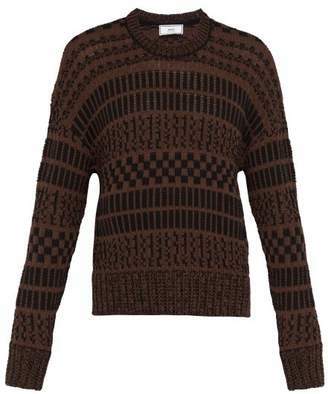 AMI - This black and brown sweater was part of the SS19 runway's opening look and reflects the â€˜relaxed, authentic and friendlyâ€™ approach that has identified AMI since it was founded in 2011 by Alexandre Mattiussi. It's crafted from a cotton blend with a crew neck, dropped shoulders and extra-long sleeves and is defined by a knitted jacquard for graphic appeal. Runs true to size.